1) Can you please tell me how did you got this constant 57.29578 ? 2) What value we will get in the heading variable? 3) Transform your magnetic declination value to radiant, if you have an EAST declination use +, if you have a WEST declination use -.Then add this value to your heading. You got float declination = 0.03025; how should i calculate from above information. anyway i've an made an ERROR here, i have to use radians and not degree as magnetic declination, because i've already trasform heaading in degrees, thank you for let me see this error. now it is corrected. Can i use this formula for LSM303DLHC to calculate magnetometer in degree? if you mean, the heading from raw values, yes. I have managed to get the heading from LSM303 thanks to you but one more problem i am facing that sensor is not giving me proper 180 degree i.e. it gives output in between 160 -170. i was expecting at least +/- 5% error. please help me with this issue. it might be your sensor, try with other one if you have, also try the adafruit or some arduino libraries. let me know results. It may be your startup stage. Anyway, check your magnetometer with other firmware and hardware, like arduino library for HMC5883L, also check your firmare and hardware, with another HMC5883L magnetometer. Got my solution, pasting here for future. Whenever I load new .hex file onto my AVR, it seems that HMC5883L modules somehow "doesn't reset" it's micro-compass inside the chip. The capacitor somehow pump the charge to the micro-compass- as far as my theory suggest! The solution was to power off the whole system for a couple of seconds so the capacitor on board, might discharge and reset. Thus I managed it to work! Can you describe or link calibration procedure? I mean how to fill hmc5883l.h with proper values. Magnetometer calibration it's a pretty copmlex thing. You have to adjust soft and hard iron distorsions. Hard iron distorsion are pretty simple to compensate, for hard+soft iron errors things changes. The alg. behind is much more sophisticated, basically it's an ellipsoid to circle fit althoritm, and too me it's too much for the non floating math and low resources of a microcontroller. It seems to me that what you are doing with your alghoritm is to compensate hard iron errors, it the robot rotate only on one axis, your are compensating one axis of course, but it's a few that i do not look at magnetometer distorsions, so i may be wrong. It could be usefull for an hard iron runtime compensation. at first you have to be sure that it display without errors on your uart terminal, so, use a uart library to send values to your terminal. Than check that the conversion of the values obtained (mx and so on), is correct for your LCD display function. 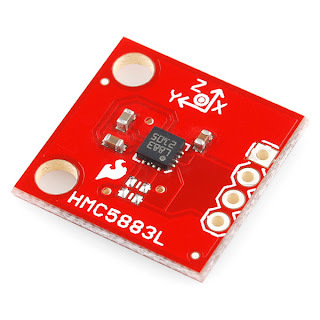 can you help me, code for hmc5883l with CVAVR for atmega32? Hello, the code in the download link above in this page can be compiled using avrgcc. If you just recompile it for ATmega32 it should work. What is the device address you have used in your code for this sensor? I'm having trouble with my sensor and code to communicate. I'm receiving a NACK when I send the device address to slave. I have posted my question in the following forum. if you could shed some light, would be much appreciated. Hello, I'm using the 3C address. Have you try another board? Or have you try this board with some other driver, like Arduino one? It may be your chip damaged. you were right my chip was damaged due to 5v signaling. I was not aware that clock and data lines should be level converted to 3.3v. Hello, I'm sorry but I can not write the code for your project, or you will never learn and grow. At first, try to understaind if you get heading from magnetometer, you can use UART for debug purpose. If you are really a beginner, take a look to Arduino, which is fairly simple than avrgcc plain code. Also another place you could take a look is the AVR Freaks forum, there you can find plenty of informations. I have a problem with this error. Can You help me? ../uart/uart.c:86:36: error: attempt to use poisoned "SIG_UART_RECV"
Note: this project it is written and tested using avrgcc and the Eclipse AVR plugin. Hello, I'm sorry but this code is for ATmega AVR. You can port my code.